Even the divine get hungry. Some would say that the gods of Olympus lived off the suffering of mankind – and although it may have appeased part of their appetite, it did not sate them. It was actually nectar that quenched their thirst and ambrosia which nourished them. This mellifluous syrup was versatile stuff. Not only did it succour these immortals, it improved their looks (Athena used ambrosia to augment Penelope’s beauty) and made them smell pretty too (the graces anointed Aphrodite with it after her arrival in Cyprus). If a normal being were to get their hands on it, they were ensured eternal life, as was the case with Achilles: his mother, the sea nymph Thetis, smearing him with it before passing him through fire (obviously allowing him to gain immortality) until Peleus interrupted, leaving solely Achilles’ heel unsinged and we all know what the consequences of that were. 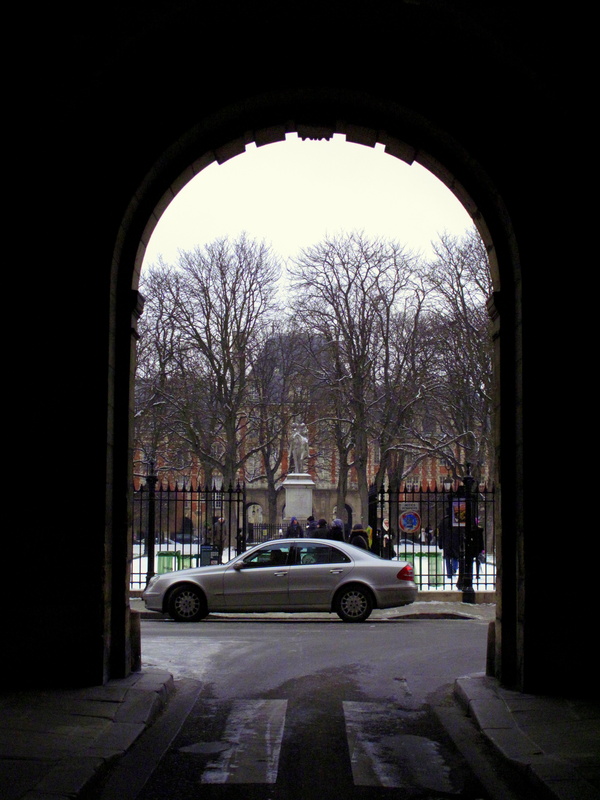 Thus, bravely I made my way to the Place des Vosges wherein l’Ambroisie has resided since 1986. Bernard Pacaud initially opened this independent restaurant, his first, in 1981, on the rue de Bièvre. Before l’Ambroisie, he had worked at Vivarois (3*) with Claude Peyrot, a protégé of Ferdinand Point and pioneer of nouvelle cuisine. He had started there as an unpaid stagiaire, rising through the ranks to run the kitchen (incidentally, soon after Pacaud left, Peyrot lost his third star). Even earlier, he had been chef de partie at La Méditerranée then sous chef at La Coquille. However, though born then orphaned in Brittany, his first job was near Lyon, washing dishes at the legendary La Mère Brazier (3*) in Col de la Luère. 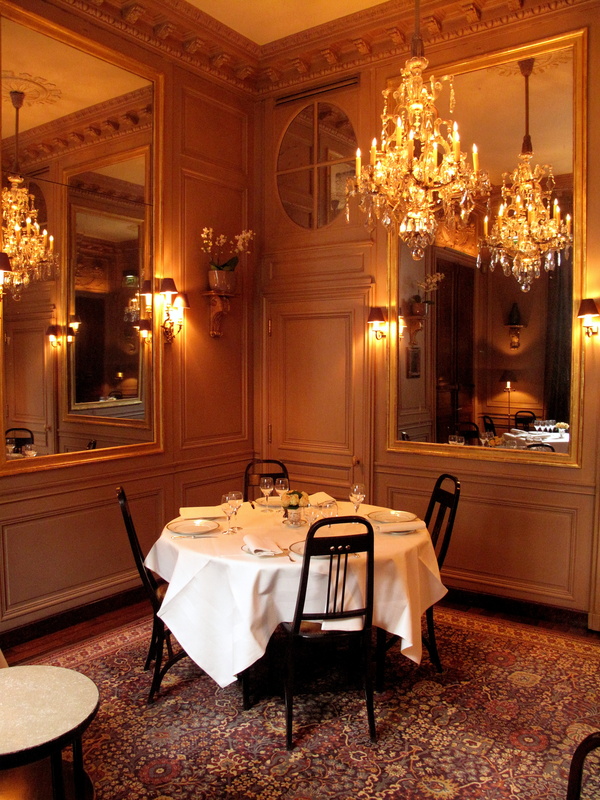 This was the second restaurant of six-star Eugénie Brazier; so titled as she owned two three-star restaurants. She was the first ever to accomplish this, doing it decades before Ducasse did it in 1998. This mère lyonnaise was also the grandmother of nouvelle cuisine and, at her death, Christian Millau (of Gault Millau), summed her up as ‘anti-big restaurant, anti-big cuisine’. It appears as though Pacaud learnt much from her, as did Paul Bocuse who also began here. The former still holds a letter from ‘la mère’ to which he turns to for inspiration even today. At l’Ambroisie, success came immediately, as did Michelin stars: the first arrived in 1982; the second, 1983; and the third followed in 1988. As meteoric as this rise was, it was a muted one. This was intentional; Pacaud is a modest man, living above his restaurant (which happens to be in the most aristocratic of apartment blocks…), eschewing all advertising and rarely dancing the dining floor, doting over diners – he expresses it best himself: ‘I am very shy and if I am in the dining room, I am not in the kitchen’. And he is always in the kitchen. Pacaud prefers to interact with his guests through his cooking and puts a lot of himself into the dishes he serves. Pacaud characterises his classic cuisine as ‘very pure, not too busy’ and as an amalgam of influences, but does not specifically admit to a single style or any actually. He claims to have not found ‘his own’ yet, but to be just doing what he learnt to at Peyrot and Brazier. That being said, there are some strong fundamentals that do manifest themselves: the quality of ingredients clearly lies at the heart of his philosophy, as does showcasing their natural flavours. One well-known story that illustrates this was when Pacaud first opened l’Ambroisie. After nine months, his accountant was sure they would be bankrupt in only one more month because of the chef’s exorbitant expenditure on produce – he was creating dishes that cost more to make than they were being sold for. There is also a simplicity with plates stripped down to solely what is essential – each recipe has only three or four elements with one of them dominating the dish. Less is certainly more. The chef, a perfectionist, has an almost religious deference to the seasons and very traditional approach to cooking. He employs around half a dozen chefs and, besides a kitchen aid blender, an ice cream/sorbet maker and small robocoupe, uses no modern appliances. 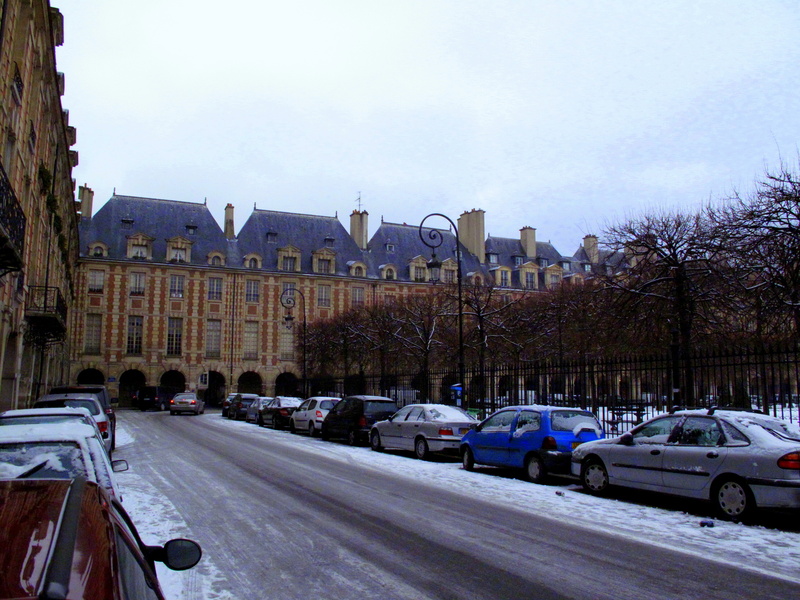 The Place des Vosges, dating from the start of the seventeenth century and built by Henry IV, is Paris’ oldest square. 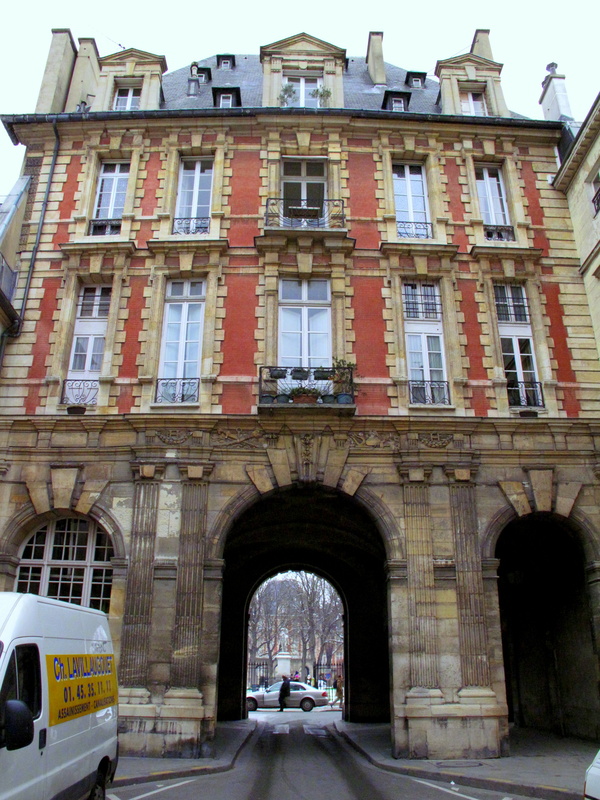 Long ago it was a royal residence, but that was when it was still the Hôtel des Tournelles; in its current form, it has been home to such Frenchman as Victor Hugo and Cardinal Richelieu. 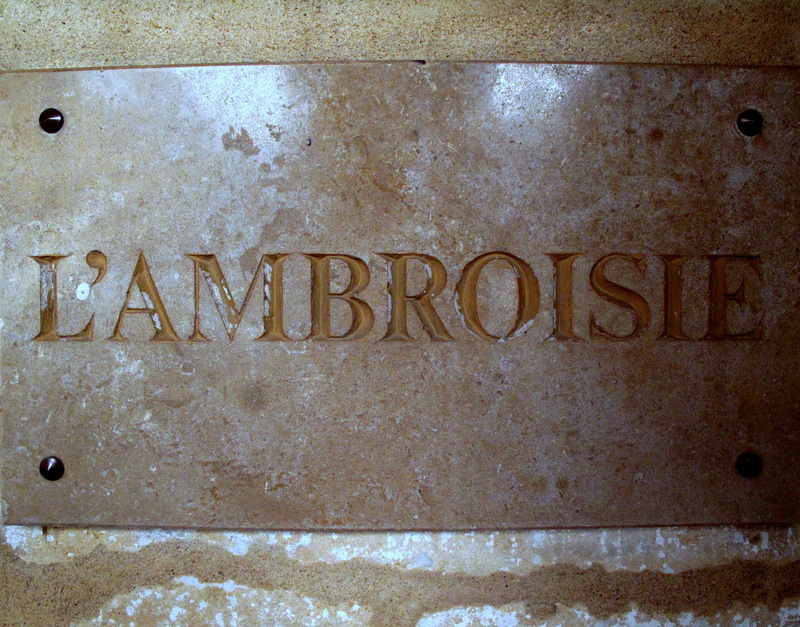 It is a fitting address for l’Ambroisie – considered by many as the haughtiest of haute cuisine restaurants. In contrast to this though, the entrance, embedded in the famous large, buff shaded stones under the vaulted arcades, is unassuming and rather austere. Within there is a small antechamber then the first of three dining rooms. 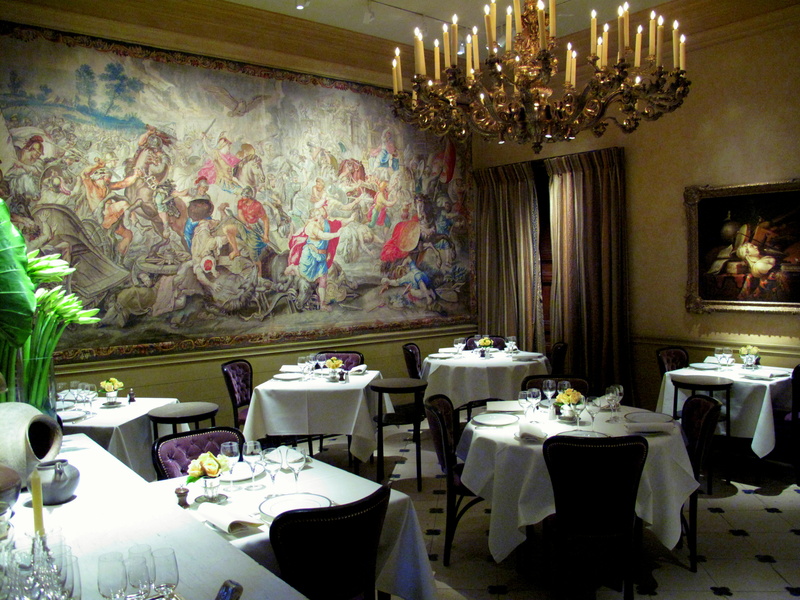 Overlooking this square space, an Aubusson tapestry, stretching across the whole back wall, depicts a classical battle scene. Beneath it, six tables are intimately, but not tightly set with royal purple velvet chairs that add a dash of colour. A golden chandelier hangs over black-and-white marble whilst oil paintings grace the walls. The second room, decorated by Pacaud and supposedly where the select few sit, is warmer and more spacious. In here, the chandelier is crystal, the velvet is ochre, the tables number five and the floor is parquet, but mostly covered by chinoiserie carpet of crimson, green and indigo. On each honey-hued wall, tapestries portraying the garden and its fruits are interrupted by tall mirrors. On the windowed side, embroidered curtains drape from ceiling to floor and a marble serving station sits below the mirror, matched by another on the room’s opposite side. The third room, a private dining area, is smaller and simpler – there are just two tables and no tapestries, but another crystal chandelier floats overhead. I may have painted a grand picture, but there is a relative minimalism about the décor. Fabrics are soft and lush; tapestries rich and elegant; the marble, polished; but there is no ostentation or flamboyance. There are the necessities of a dining room – and these are of the most superb standard – but they do not distract the guest. A simple silver vase filled with yellow roses, Raynaud crockery and cutlery are all that clutter one’s table’s top. Like Pacaud’s plating, there is an explicit lack of excess. The final effect is formal, yes yet also comfortable – as if one were in the refined home of an affluent friend with fine taste. 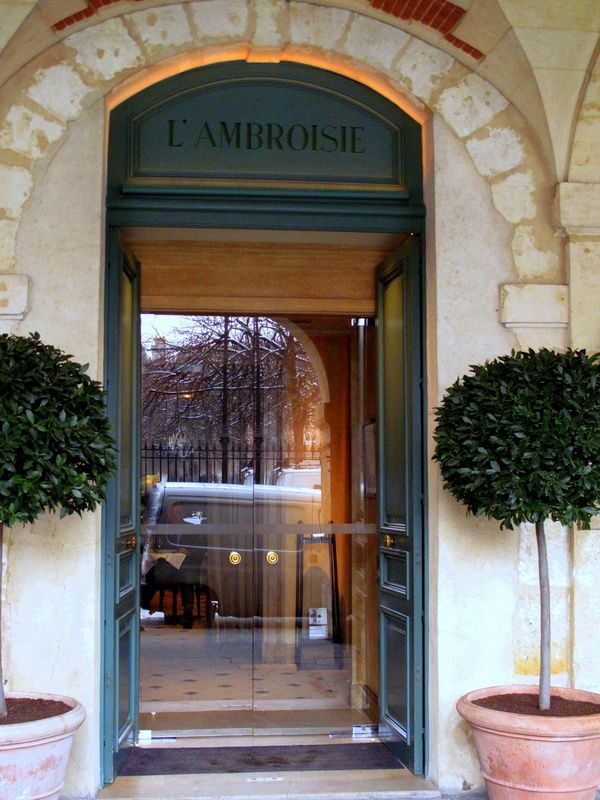 I arrived at l’Ambroisie a little early, but as it was snowing outside, I was invited to wait in the foyer as the staff readied themselves and then the dining room. Whilst here, Monsieur Pacaud himself walked in, emerging from the camouflaged kitchen door to the left after one enters. We were both rather surprised at the sight of one another – for different reasons of course – but exchanged greetings. Once shown to my seat, I was supplied with the menu. It would be superfluous. 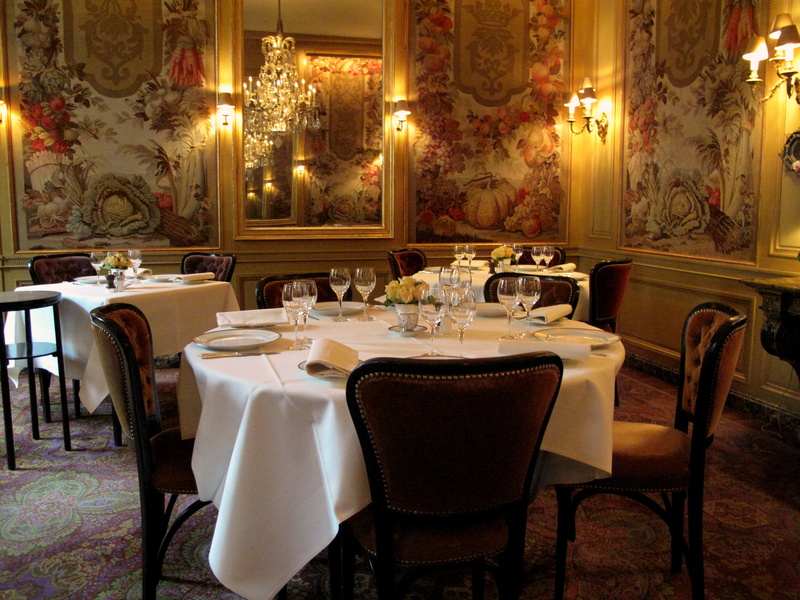 I had already arranged to have one of l’Ambroisie’s most fêted dishes – le feuilleté de truffe fraîche ‘bel humeur’ – and for the other courses, I had an idea of what I thought I had to order, but welcomed the maître d’hôtel chaperoning my choices. Amuse Bouche 1: Comté gougères. 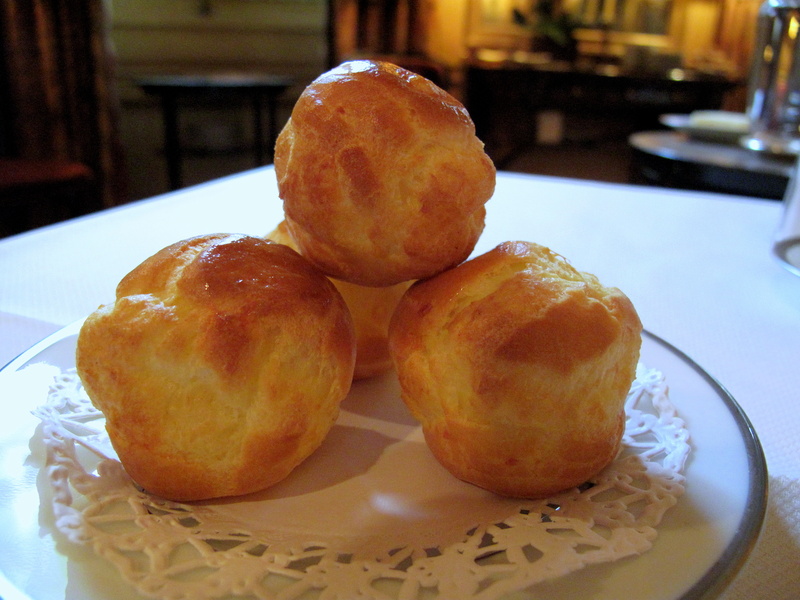 For the first amuse, four fluffy gougères of Gruyère de Comté were served. These Burgundian specialities were fresh and feather-light with flaky, fairly crisp pâte à choux, fortified with rich, nutty and subtly sweet Comté cheese from Jura, encasing a hot pocket of air. Les Pains: Pain blanc et pain campagne. White and wholemeal breads were both offered. These were brought from the boulangerie, Au Levain du Marais, literally around the corner from the square on the rue de Turenne. The bakery is highly thought of and rightfully so; both the plumper blanc and denser, fuller campagne were good with firm crusts and soft centres. The butter was Échiré; this hundred-year-old A.O.C. 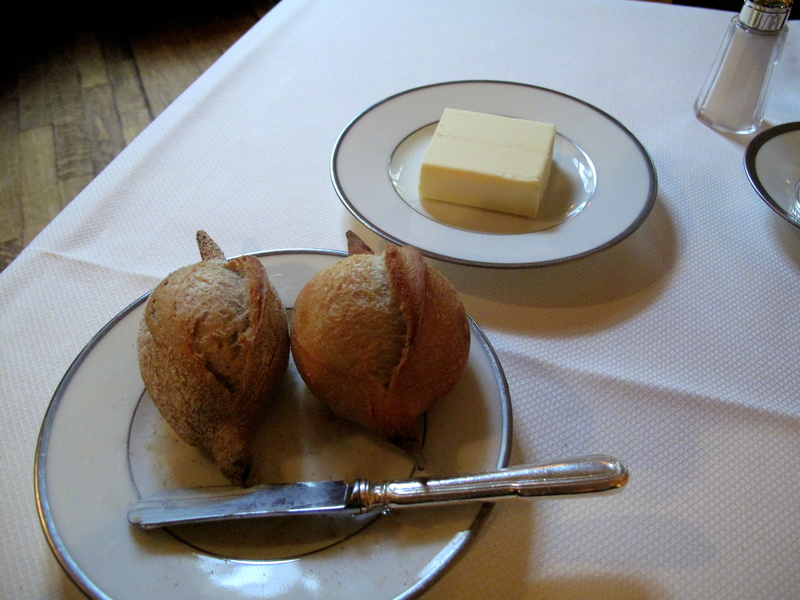 beurre des Deux-Sèvres, the secret to whose taste lies in the local soils, had delicate, subtle flavour. Amuse Bouche 2: Velouté de butternut avec crème fouettée de truffes blanche. 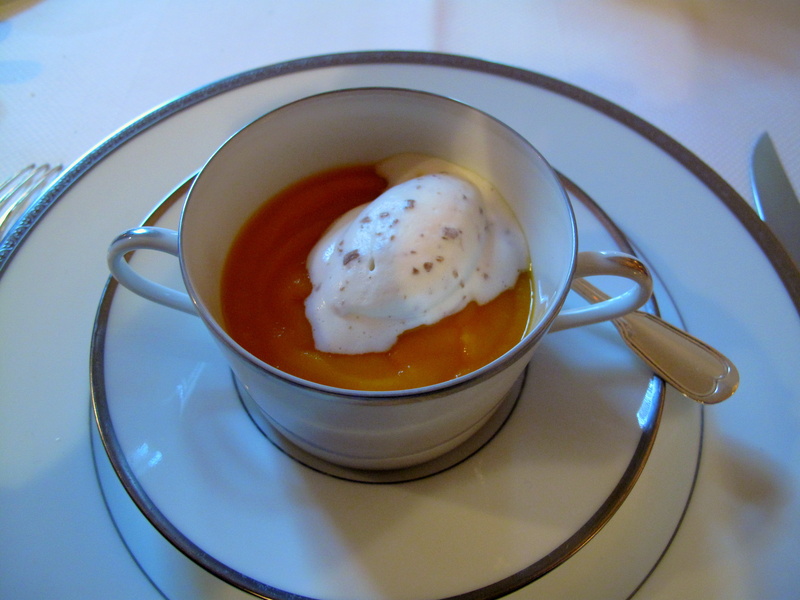 Butternut squash soup crowned with a quenelle of white truffle ‘whipped cream’ was delivered in a double-handled cup. The welcoming scent of sweet squash ascended from the creamy velouté, before cold white truffle crème started to melt and emanate its own odour. Each grainy, smooth spoonful of the two together presented a harmonious nutty, earthy sweetness and left a gentle peppery linger at the back of the throat. A light, but satisfying start. 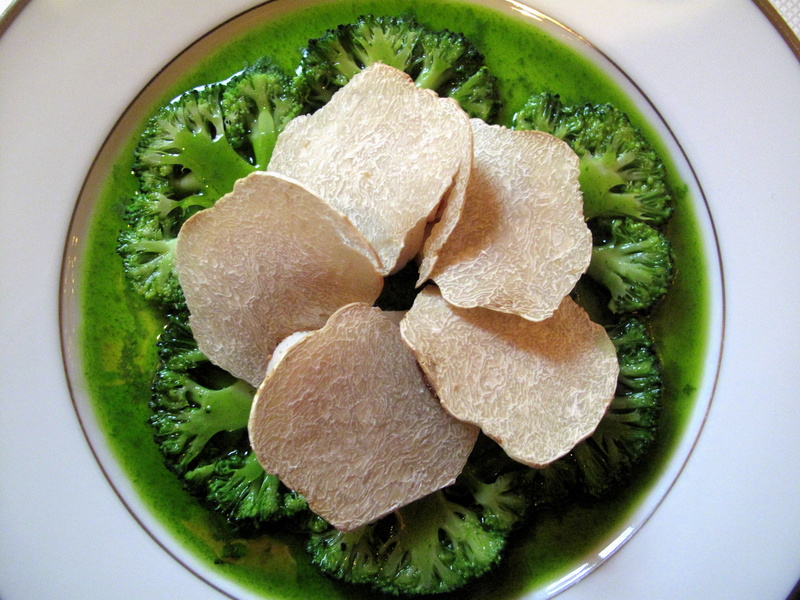 Entrée: Corolle de noix de Saint-Jacques et brocoli à la truffe blanche d’Alba. 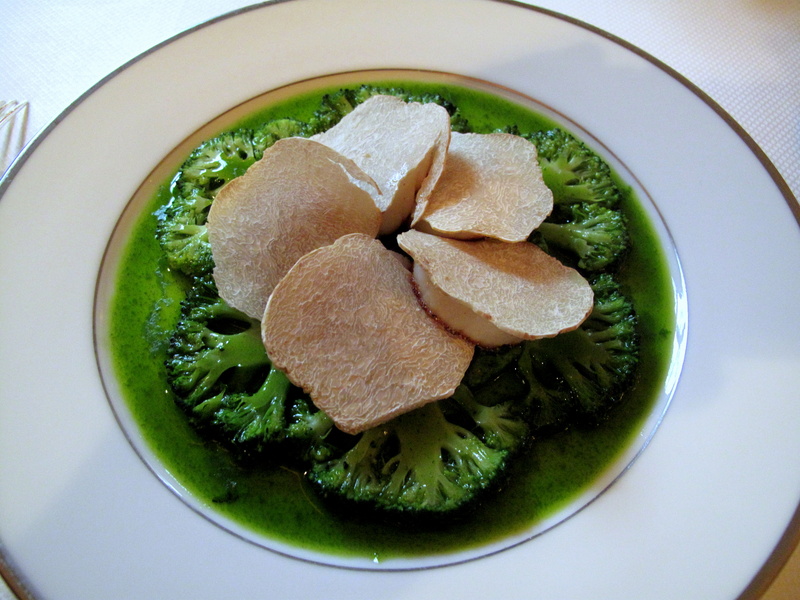 A girdle of emerald green broccoli, planted in parsley coulis, begirded crushed broccoli pulp, upon which were placed, as a wreath, a quintet of Brittany-sourced scallops, layered with large and overlapping laminae of white truffle from Alba. These were the last truffes blanches of the season, but still smelt strongly – the sheer size of the shavings, and their thickness, undoubtedly helping to heighten their olfactory force. The scallops, steamed gently, remained moist and almost buttery and were full of nuttiness and sweetness. The vegetables were simply the tastiest examples of their kind that I have ever eaten. These crunchy, al dente fresh florets of baby broccoli were sweet, earthy and also nutlike. The pellucid huile de persil, tinged with garlic, was gentle and grassy. There was stunning agreement in this ‘mer et terre’ dish. Every flavour of every ingredient played a role, expounding on those of other elements, whilst having its own extolled by them. First, the scallop’s sweetness brought out that in the broccoli and sauce, but then, the savours developed and the nuttiness of the brassica, working with that of the scallops and truffle came to the fore and grew until the last forkful. In the background meanwhile, there was obvious accord between the truffle and garlic and the broccoli, parsley and truffle too. I must also mention how aesthetically engaging this plate was. Plat Principal 1: Escalopines de bar à l’émincé d’artichaut, caviar oscietre gold. A platform of thin-cut artichoke heart half-circles, scattered with dill and sitting in beurre blanc interspersed with Iranian Oscietra Gold caviar, supported pan-fried filets of line-caught sea bass. The lustrous black beads, in optical collusion with the fish’s own shimmering skin, made mandatory the first taste to be theirs. Creamy, buttery, briny, subtly acidic and nutty. The second sampling was of the sea bass, pristine white bar the rouge grooves that ran through each meaty morsel. Delicate, flaky, soft and silky, it was possibly the best bass I had ever had. 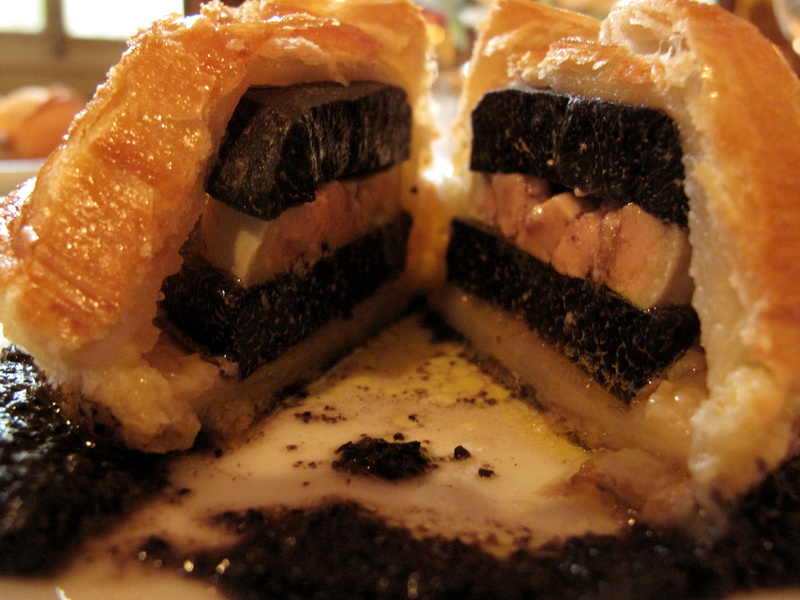 This was another accomplished dish – the detail in its construction inspired and crafting consummate. The beurre blanc, an excellent foil for the milky fish, had a sweet acidity that worked well with that of the dill and crunchy artichoke. 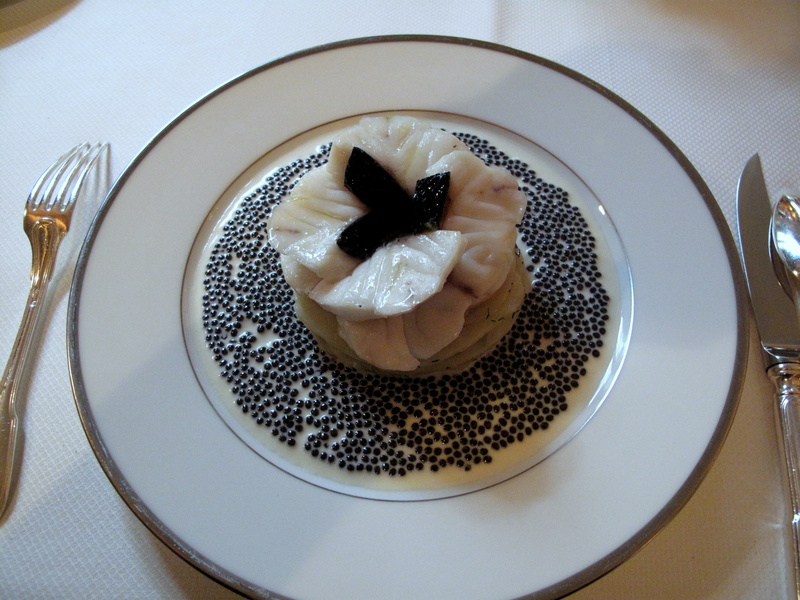 This sweetness offset the saltiness of the caviar, whose nuttiness, in turn, struck a sympathetic note with the artichoke. Another brilliant balancing act. Plat Principal 2: Feuilleté de truffe fraîche ‘bel humeur’. 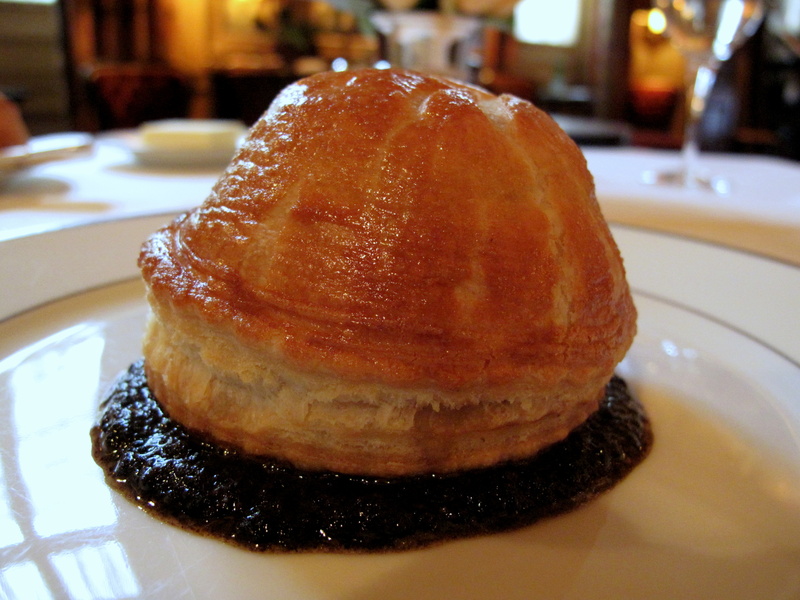 A golden, glistening miniature mountain of puff pastry, shaped like a capotain with its summit scored and resting in sauce bordelaise thickened with black truffle, was presented standing stoutly in the centre of a large plate. With it arrived the fragrance of fresh baking and a whiff of truffle, not to mention a bowl of mâche lettuce drizzled with crème fraîche and generously garnished with truffles – this was to be eaten later, I was told. A knife was placed in my hand and instructions given, ‘coupez-le par le millieu pour l’ouvrir, s’il vous plaît’ – or ‘get it open!’ I obliged my hosts. 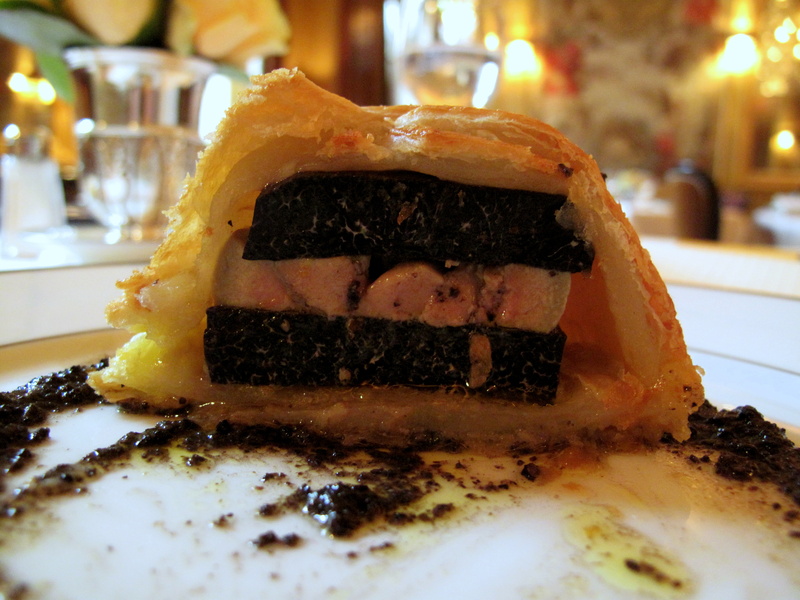 Inside, one hundred grams of black Périgord truffle, split into two hockey-puck-like slices, made a sandwich with duck foie gras filling, all enclosed in the pâte feuilletée coating. The tranche of foie was surprisingly, yet pleasingly, still molten in its middle and very tasty; whilst the thin pastry, crisp on the outside, softer within, was just lovely. The truffle itself was approached with nervous eagerness – I had never had it in such quantity or form. It had to be cut – I had never had to cut it before either. From the initial forkful, its solidity and firmness registered first; I had to bite into it, literally cracking it apart with my teeth. The second thought surrounded the complex taste; not quite as strong as I expected, but smoky, earthy and yet clean. The truffle coulis was an excellent complement, itself imparting intensity, richness and moisture, but also infusing into the feuilleté from its foundations up. Almost as an afterthought the lamb’s lettuce was consumed. 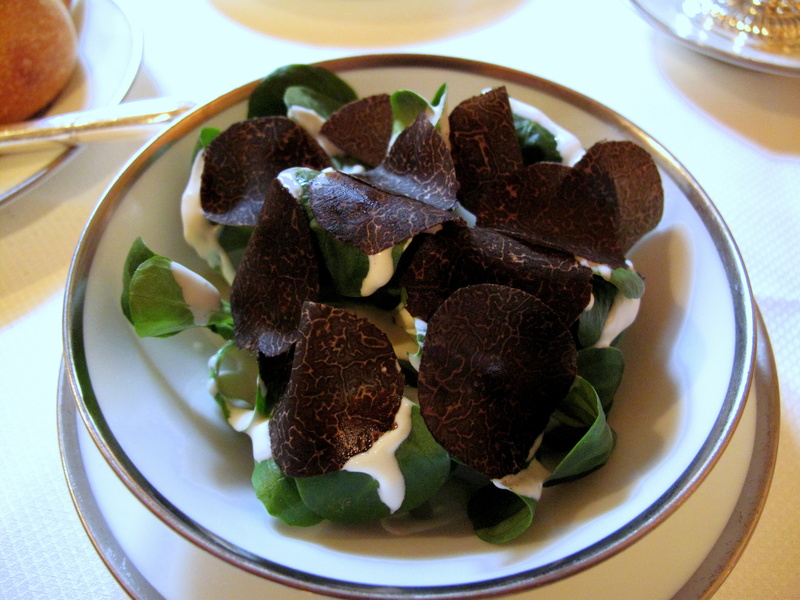 The leaves, spiked with sour, zingy vinaigrette, were crispy and nutty, harmonising with the truffle. It was, in fact, a rather refreshing and capable little salad. One final point. Those familiar with the dish may be thinking that I have missed something: that wow moment. You see, opening up the pastry has for many been just that – the musky, heady truffle incense escaping and filling the room, everyone’s (envious) head magnetically turned to your table…Regrettably, this did not happen. The odour was fairly obvious, but not what I would even describe as strong. I do not have a definitive answer as to why this was so, although the easiest explanation is that the truffle itself was second-rate. I find it almost hard to believe, however, that when all the produce in all the other dishes was so impeccable (and in some cases, the best renditions of which I can recall eating) that the main ingredient of the main dish, which had to be pre-ordered, could have been so utterly mediocre. Pre dessert: Sorbet poire William. 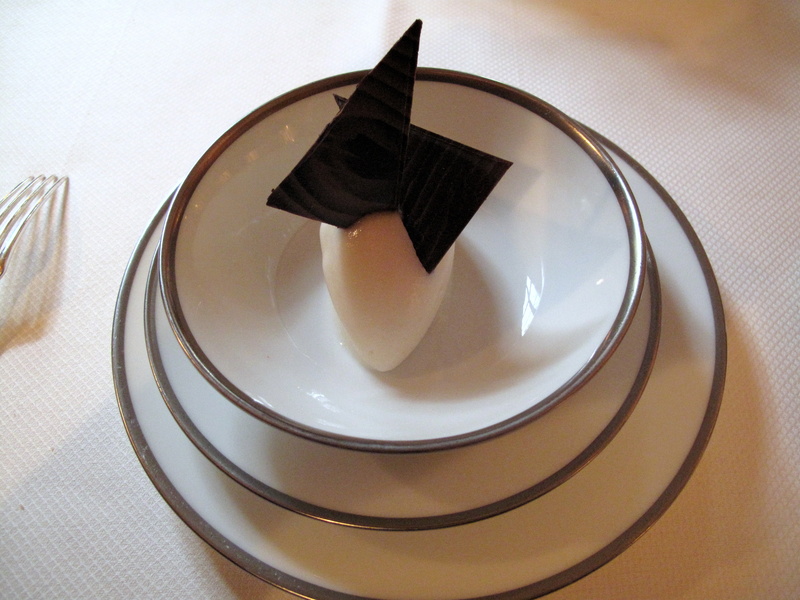 A single quenelle of Williams pear sorbet studded with two chocolate triangle tuiles came next. The ice cold sorbet, creamy and smooth, tasted simply delicious. The clarity and sweetness of the fruity flavour was startlingly good. 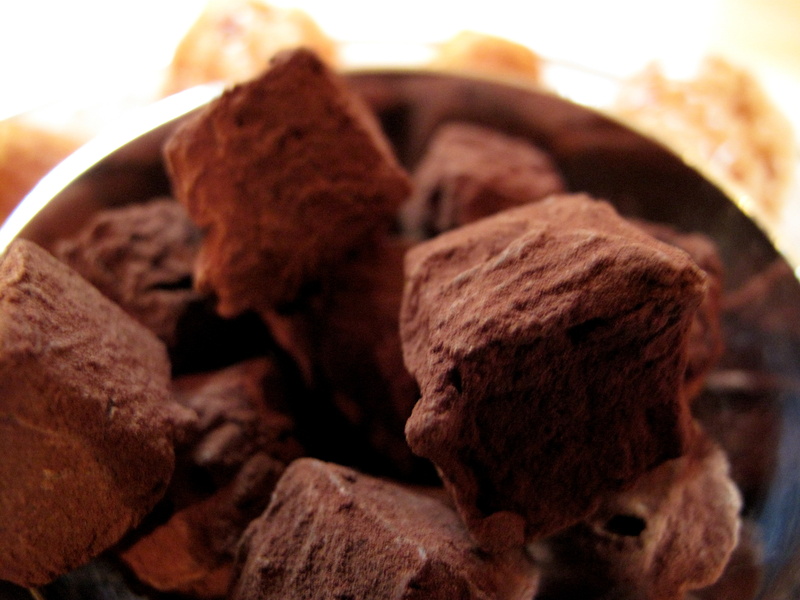 The chocolate, supplied by Michel Chaudun, was dark and verging on bitter. Chaudun, who was head chocolatier at La Maison du Chocolat before opening his own shop on rue de l’Université, is one of Paris’ best chocolate makers and caters for all l’Ambroisie’s cocoa requirements. Dessert 1: Arlettes caramelisées fromage blanc, citron et pamplemousse confits. Instead of cheese, I chose another dessert: thick chunks of confit lemon and grapefruit were served alongside two arlettes that embraced a substantial spooning of fromage blanc. Arlettes, a legacy of the famous Parisian patisserie Dolloyau, are basically puff pastry biscuits that have been baked with icing sugar; they are also crispy and subtly sweet. The candied fruit, firm and grainy to bite, was sharp and sugary at once whilst the fromage frais, slightly sour and, in effect, cooling. The citric coulis added a little more zing as did the mint leaf, menthol. This was such a simple, but enjoyable, contrast of flavours and textures. Dessert 2: Tarte fine sablée au cacao amer, glace à la vanille. A considerably sized slice of cake, composed of dark chocolate sabayon, dusted with coco powder and sitting on crumbly, crusty pastry, was partnered with Bourbon vanilla ice cream set with a dried piece of vanilla pod. 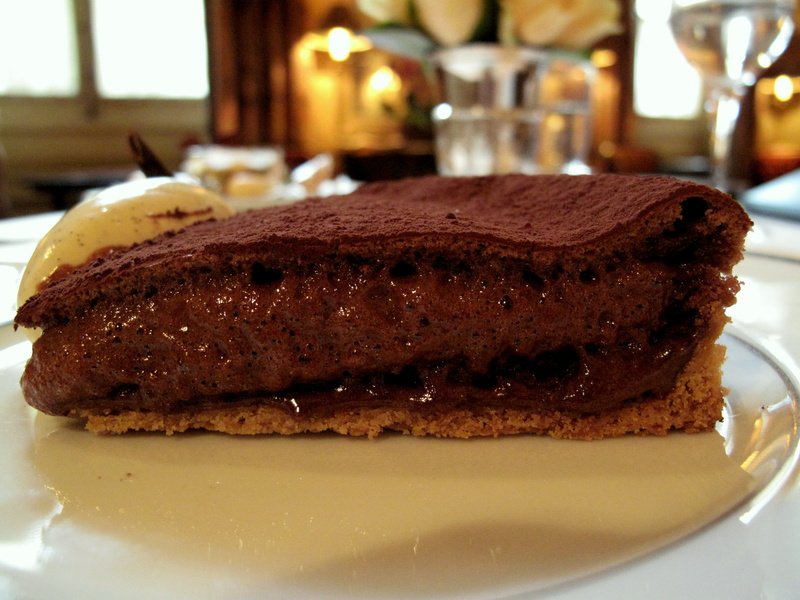 This is l’Ambroisie’s must-order dessert and one cannot stress how alarmingly light it is. 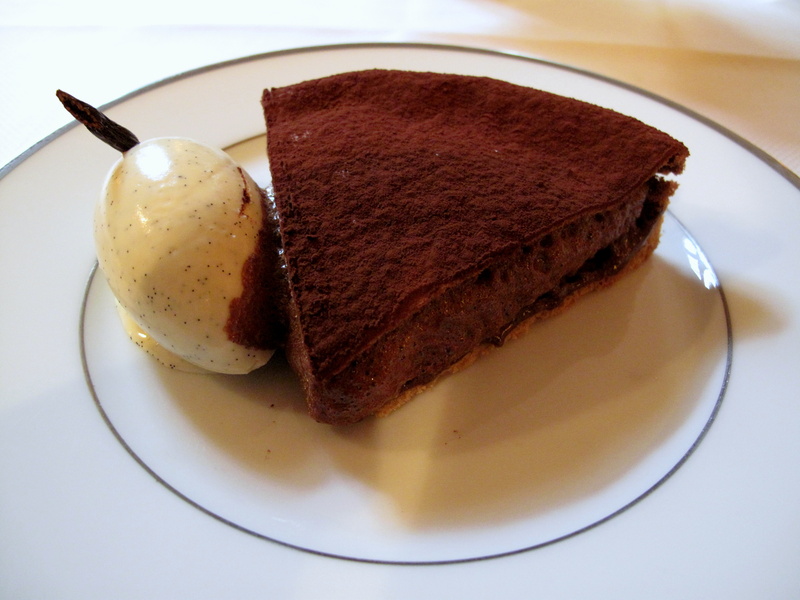 Without detriment to its taste, which remains bitter and bold, the tarte itself is ethereal in its presence: a spoonful is taken, placed in the mouth, the chocolate is tasted – then it just disappears even before one has had the chance to swallow. Its foamy filling almost resembled that of a soufflé that has been made and allowed to collapse. The chocolate is again Chaudun, who Pacaud has so much confidence in, he does not even know the cacao’s recipe (he simply tells him what he wants – and gets it). The accompanying ice cream was just as intense and apparently has six pods of vanilla per litre made. Technically, this was a truly impressive treat. 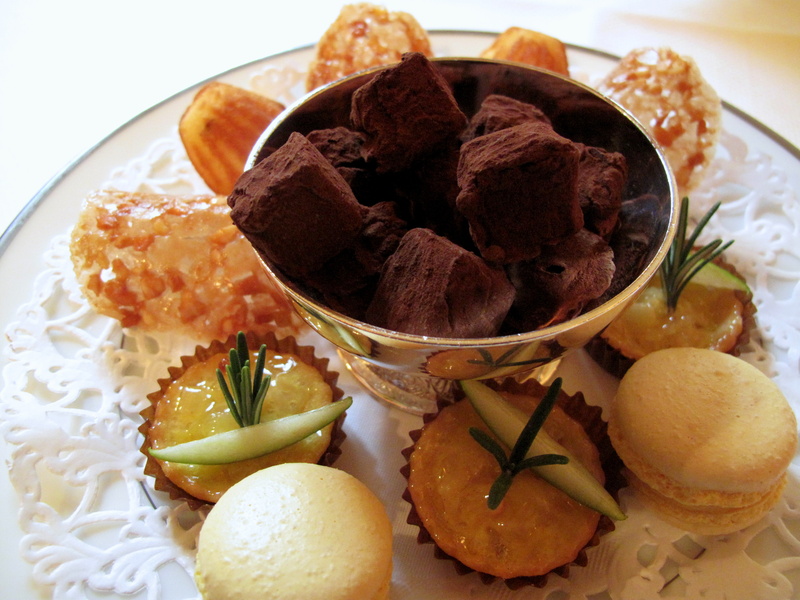 Petit Fours: Madeleine à la vanille; truffe chocolat; tartelette Normandie; macaron citron; et tuile d’amandes. An assortment of vanilla madeleines, chocolate truffles, Normandy tartlets, lemon macarons and almond tuiles foreshadowed lunch’s finish. The madeleines were light, crisply-rimmed and softly-centred, but had cooled and were short of vanilla. Truffles were nice with harder coats and runny cores. Tartlets of creamy vanilla custard, sour apple and minty rosemary, were good too. Macarons were sufficiently tart, but a little chewy. The best of the bunch were the almond tuiles; sweet, crunchy, caramelised and nutty, these were excellent. Service throughout was impeccable. I was warmly welcomed by all the staff and well taken care of, first by the maître d’hôtel, and then Laurent, who was my principal serveur. Having pre-ordered the feuilleté de truffe fraîche ‘bel humeur’ and eager to taste the sea bass and chocolate tart, I let the maître d’ choose the remaining courses. He did a great job – the Saint-Jacques and arlettes were both superb selections. Service was everything one would expect at this level, but what struck me was how much it contrasted to what others have written and told me about what to expect. I found the staff warm, friendly and helpful; towards the end of dinner, we were even sharing a joke or two. All the staff spoke English fluently and were very willing to do so even though I preferred to practice my French. A second surprise was the uncommon conviviality of the other guests who even greeted me as they entered and took their seats. As I left l’Ambroisie, I had not made up my mind about how I felt about my meal there. I was rather confused to be honest. On the one hand, I was pretty sure I had eaten some of the most brilliant food of my life. On the other, I was not sure how much I had enjoyed it. There was also the disappointment of the ‘bel humeur’ to contend with. I felt the food interested and intrigued me, but I had to question how delicious it was. Everything tasted good – that is certain – but none of the flavours on their own had me whispering wow to myself. To some extent, it was sort of as if my palate was given limited import, being quickly appeased in passing before being bypassed on the way to my brain; my reason and my logic instead were the main aim. And, to be fair, it was a direct hit. After that day, I had time to reflect on the fare more thoroughly. What started to dominate my thoughts were the Saint-Jacques and escalopines de bar. These two dishes seemed to me to sum up best what was best about l’Ambroisie. Both seemed like recipes that had been worked, refined and polished carefully and precisely until they were finally served to me in their perfect states. In these two – and maybe most with the scallops – I was left so impressed by the combination and choice of ingredients. Everything on the plate had its part to play, which it did, but each also offered more than just ‘itself’; every other element performed better because of it too. Pacaud was able to exploit the subtlest of relationships between different ingredients in the most intelligent and intense of ways to produce what a plate at this level ought to be – more than a sum of its parts. Each was an intricate, tantalising, complex cobweb of flavours. Pacaud’s dishes have life too. Highlighting the same two courses again, I was amazed by how the taste of the dish changed, grew and evolved as I ate it. Once more to focus specifically on the Saint-Jacques, initially, the sweetness of the shellfish and how it emphasised that in the broccoli was what prevailed. However, slowly, the nuttiness of the shellfish, but more so of the truffle and brassica, took over and dominated my taste buds. The technical talent on display on all the plates was flawless with only one faux pas, or faux saut, from the kitchen. 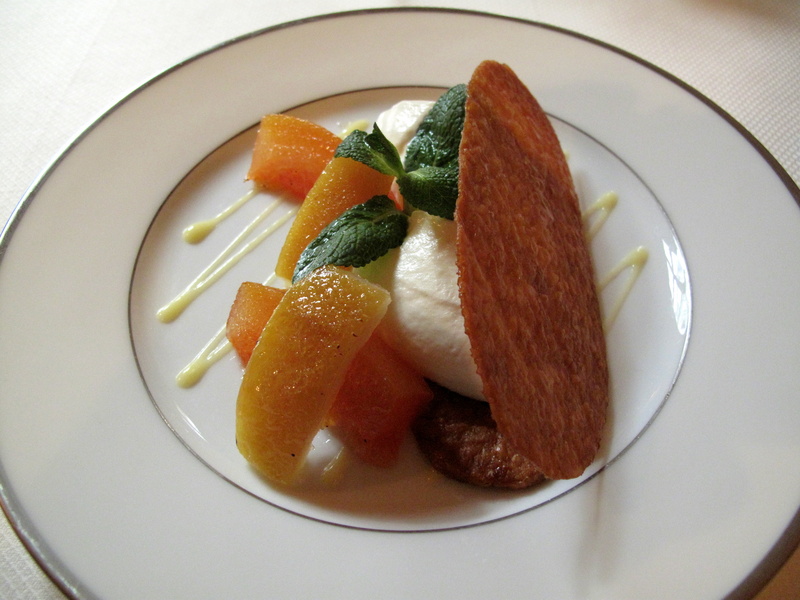 This mistake, however, was with what was essentially the meal’s main event, le feuilleté. One friend described the moment that that pastry is parted as when ‘the clouds open and the sun shines down upon your face’. That obviously did not take place – actually, it reminds me to mention how cold it was and how chilly the dining room became. Nevertheless, what I find rather funny now, is how I have completely ignored/forgiven this letdown and feel no ‘bitterness’ over it; my feelings and my mind are monopolised by what was good and what pleased me seems to outweigh this disappointment. I confess too that I have a special soft spot for homemade feuilletés, so I was able to take solace in the fact that, even without that moment, it was still the best pie I had ever eaten. I want to also comment on the presentation here. I have read that the look of Pacaud’s food is a by-product of its manufacture. This may well be the case, and I certainly agree that nothing is sacrificed for appearance’s sake, but I also think that what I was served were some of the most beautiful dishes I have ever seen. Each offering was elegant, graceful and sophisticated. With regards to Pacaud’s approach to cuisine, I see it as one concentrated on quality, purity and precision. There is the quality and purity of the produce which, again the truffle withstanding, was outstanding: the broccoli, sea bass and caviar standing out. This is reflected in the purity and precision of flavours, which precision in execution is essential to achieve. The chef clearly seeks to showcase his ingredients and allow them to express themselves as fully and as well as they can; ‘some products are so lovely, I’m afraid I’ll spoil them,’ he says. The oft-stated simplicity of the cooking is superficial: beneath the surface there exists tremendous attention, skill, depth and passion. Behind his modesty, his shyness, I also sense that Pacaud strives to serve the very greatest possible dishes, but I doubt this is fuelled by any ambition to be the best or that he feels in competition with Paris’ other cooks – although he may well be competing with himself. He is certainly a complex character and I do not wish to dwell on this aspect, but one fact that I find very insightful is that he supposedly no longer serves risotto because an Italian friend makes it better than he can. Following my experience at l’Ambroisie, my thinking and feelings were in a state of flux, but constantly evolving, slowly at first, then faster, into respect and appreciation. I found the judgement, finesse and thoroughness of the dishes breath-taking and mentally stimulating. I had never before been so challenged by a chef – it was possibly the strongest intellectual reaction I have ever had to food. But I certainly liked it. However confusing and complicated, however many thoughts this meal provoked, I am now left asking myself only one question: how quick can I return? Lovely review; the broccoli and sea bass dishes in particular sound magnificent. Did you feel there might have been a bit too much truffle during this lunch? Or can one never have enough? Too much? One probably can not have enough, but in these dishes, this meal, everything was impeccably judged. Each plate was a lesson in balance, finesse and cooking really. 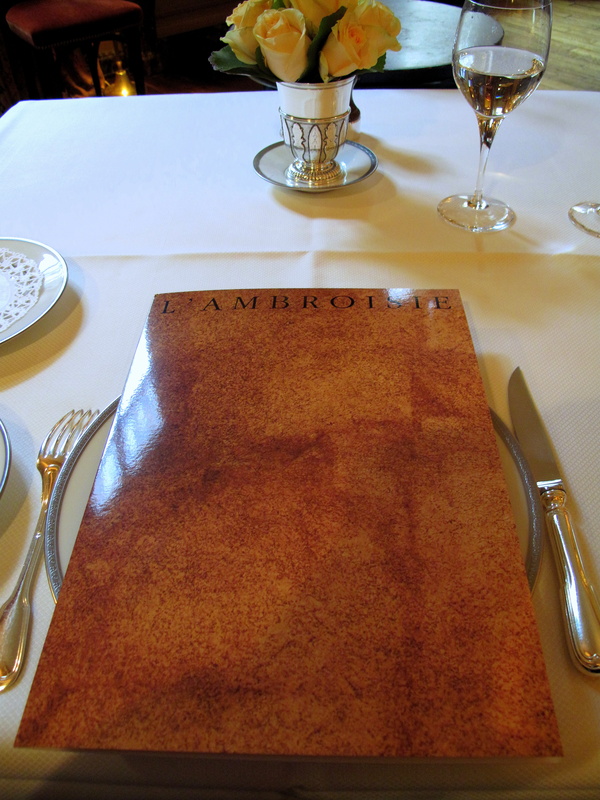 I still consider l’Ambroisie the real classic among so many starred restaurants. I wouldn’t mind if they could offer me more truffles. The quality of the ingredients is just the top and best. After all, no l’Ambroisie post would be complete with a comment from one of its very biggest fans. Amazing, Food Snob! So beautiful food. Hope I can afford it one day. Great review!! Your description is perfect, I hope I’ll go to l’Ambroisie one day! Nice review, nice dishes ! Anyway, I personnally did taste the feuilleté and sea bass myself in past years, and i consider those are most probably amongst pacaud’s most “achieved” dishes. As for the truffle aroma that did not live up to your expectation when cutting the feuilleté, it may have been because you went there very early in black truffle season (at least i guess you went early, since there still were some white truffle dishes on the menu), and so the truffle you had, altough of good size, was probably not mature enough. it may be worth trying getting there again in late february and see if there is a difference. I have a question about wines : what did you go for? Alex: Merci and don’t be so modest! I certainly tried to go for the ‘classics’ on my first visit, as you already noticed I did at Lasserre also. I ate here on Jan 6th (all the reviews are dated from the day of the meal) and certainly agree with your assessment of the truffles. My experience with them in Paris in general was indeed a poor one. However, there is the argument that they should not have been offered if the truffles were not good enough. I am sorry to say I did not drink alcohol with this meal; I have sort of a habit of not ordering alcohol when dining tout seul. I had one of my best gastronomic experiences here as well as Pierre Gagnaire in St Etiene and Rue Balzac. 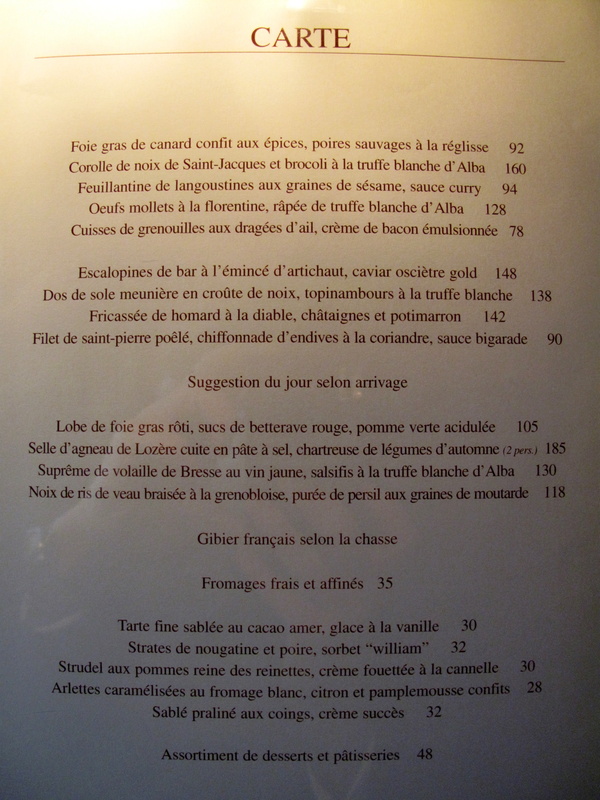 Both very different of course but interesting to note that Pacaud does not like Gagnaire’s cuisine. I do not imagine Pacaud much into visiting other fine dining spots. I would venture tradtional bistros are more his sort of place. i would like to taste the”Feuilleté de truffe fraîche ‘bel humeur’”next time..
L’Ambroisie est le premier 3 étoilé dans lequel j’ai eu la chance de manger il y au moins 7 ans, et je m’en souviens encore ! Le clacicisme absolu dans la plus grande précision des goûts et des cuissons. Pour moi ce restaurant est indépassable, en dépit des modes culinaires. Je vous remercie de partager vos souvenirs. Je conviens que l’Ambroisie est intemporelle – et il n’a jamais besoin de changer! it was good and all, but i found the flavor components to be pretty pedestrian, sort of filling the mold of the typical french restaurant shoving mass quanitities of truffles and foie gras. Lunched at L’Ambroisie this past Friday March 25th 2011. 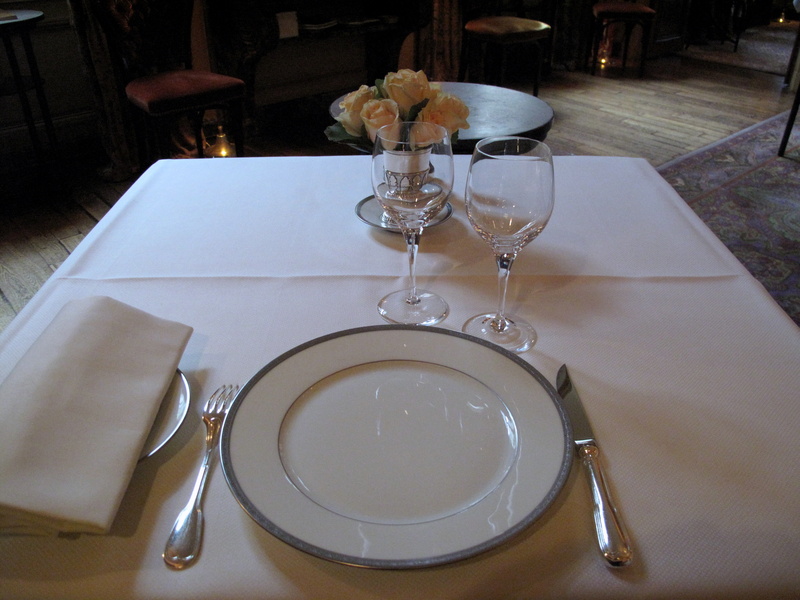 It was the only 3 Parisian 3 star Michelin that I had not tried yet along with Ledoyen. 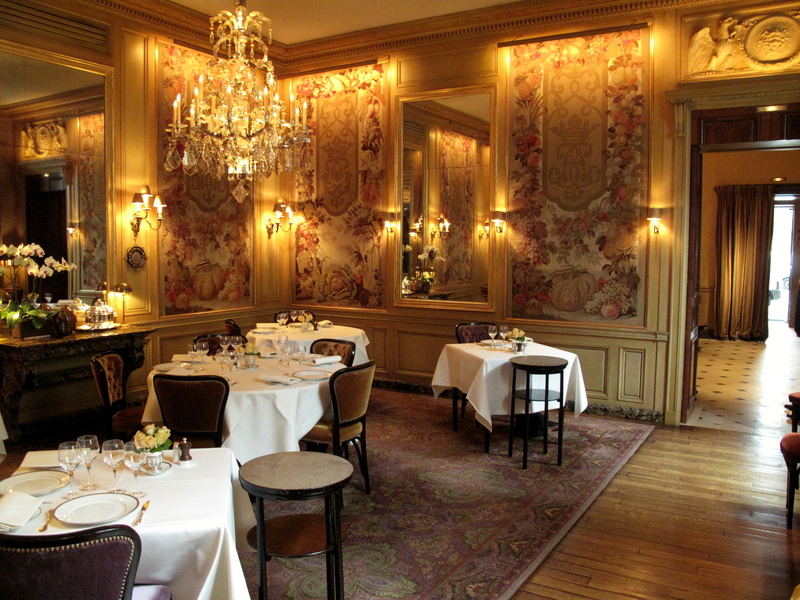 I did both on this trip to Paris (reports on my blog) and L’Ambroisie is now my personal choice of #1 Parisian 3 star. I am also fond of one 3 star that you like on Paris: L’Arpege, but L’Ambroisie wins by a slight margin in my personal taste. Very beautiful restaurant.Which days is it open? It is open tuesday to saturday.